We’d love your help. 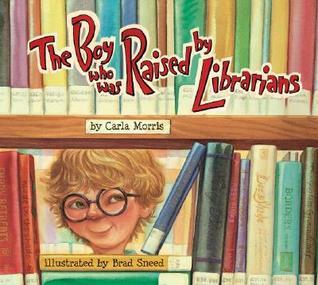 Let us know what’s wrong with this preview of The Boy Who Was Raised by Librarians by Carla Morris. To ask other readers questions about The Boy Who Was Raised by Librarians, please sign up. is it good pls answer right away??????????????????????????????? Carla Morris' The Boy Who Was Raised by Librarians is sweet, humorous (and sometimes bordering on the downright silly), albeit also rather and frustratingly and majorly predictable. The author does paint an engaging and fun portrait of a curious boy who loves books and who practically lives at his local public library, as well as the librarians of said library, who not only continuously inspire and re-inspire Melvin's curiosity, but also help the boy with research, help him rehearse for a play, Carla Morris' The Boy Who Was Raised by Librarians is sweet, humorous (and sometimes bordering on the downright silly), albeit also rather and frustratingly and majorly predictable. The author does paint an engaging and fun portrait of a curious boy who loves books and who practically lives at his local public library, as well as the librarians of said library, who not only continuously inspire and re-inspire Melvin's curiosity, but also help the boy with research, help him rehearse for a play, and even attend his high school graduation (that Melvin then studies to become a librarian is not only natural and a bit of a given, it is also a more than fitting tribute to librarians everywhere). But all being said I do have to admit that for me personally, some if not actually even many of Melvin's antics and the amount of especially research guidance he is constantly being given by the librarians seem more than a bit unrealistic and far-fetched, unbelievable to and for me. I do not think that I have ever met librarians who were that patient and that committed to their patrons (I find it sweet that the librarians seem genuinely and emotionally interested in and comitted to Melvin, but I still and actually much consider their unending, unwavering helpfulness somewhat exaggerated and overdone). And I also pretty well know for a fact that the librarians at my local branch (even those who work primarily with children) would not be all that pleased if they had to collect a bunch of creepy, crawly bugs from the carpet (Melvin spilling his jar of collected insects on the floor is perhaps mildly amusing, I just do not consider that the reaction of the librarians to this mishap is even remotely realistic and normative). 4.5 stars. (I wasn't really a fan of the illustration style, although they were well-done and apt.) Wonderful story about the power of friendship (especially from adult mentors) the joys that result in a quest for knowledge, and the wonders that can be found in the library! How can you go wrong when the second page goes like this? "He wanted to know a little...no...alot about everything. He was curious. And the library is a wonderful place to be if a person is curious. "Everything had its place in the library and Melvin liked it that way. His favorite books were always in their places, lined up on the shelves like soldiers. And his favorite people were always in their places, behind the reference desk." Is that not a description of heaven? I got happy all over reading How can you go wrong when the second page goes like this? Is that not a description of heaven? I got happy all over reading that. This is a sweet story about a boy that goes to the library every day after school, and the three librarians that help him answer his every question and learn more about every interest. The kids and I have talked about how fun it would be to sleep over at the library, so I was a bit jealous that his library had a "Spend the Night at the Library" party. "Melvin curled up in his sleeping bag near the encyclopedias. Surrounded by thousands of books, he felt rich and happy." While I thought the "librarians are amazing" message was a bit blatant, we seem to need the reminder these days. I was raised by librarians myself! That was so fantastic -- it seriously gave me chills. I freaking love my job! I am a sucker for any books about libraries, so this one gets a solid star just for that reason. The story is cute and shows the power of librarians to assist and inform, and the art is interesting, but maybe a bit too caricature-based for something that is representing real people in a real setting? I've seen this in the children's room of the library for months, if not years (time moves differently in a library). I finally decided to read it today, while I was sitting at the desk in the empty children's section.. I've got chills. I may have sniffled. I almost cried! This book, this simple, short, little picture book gave me all the feels. I was this kid. I was raised by librarians. They helped me when I was confused in school. They helped me when I couldn't find just the right book to read. I've seen this in the children's room of the library for months, if not years (time moves differently in a library). I finally decided to read it today, while I was sitting at the desk in the empty children's section.. I've got chills. I may have sniffled. I almost cried! This book, this simple, short, little picture book gave me all the feels. I was this kid. I was raised by librarians. They helped me when I was confused in school. They helped me when I couldn't find just the right book to read. And after college.. I came right back to this library, this time as an employee. And here I am now, a librarian myself. Now I get to help kids find just the right book to read. I get to encourage adults to continue their education, whether it means pick up a new book or try out a new class. A whole book full of stereotypes and pigeonholes. A silly fantasyland that is so saccharine it hurts. There is a little cottage industry based on writing children's books with pandering librarian-appeal and selling them to librarians. How I wish it would stop. Hated the illustrations. Hated them! And where were this kid's parents, anyway? Just absolutely never mentioned. More of the nonsense that family is of no value and the state (village) will raise your child. My little one really liked this book and so did I. It is a bit lengthy for younger children but she could relate having spent time at the library. It is a heart-warming story about a little boy who grows up getting to know his librarians through spending many days after school at the library. Though the story is somewhat predictable it is still a treat to watch all the characters grow older together. I liked how interested the librarians were in him and vice versa. The illustrations were very ex My little one really liked this book and so did I. It is a bit lengthy for younger children but she could relate having spent time at the library. It is a heart-warming story about a little boy who grows up getting to know his librarians through spending many days after school at the library. Though the story is somewhat predictable it is still a treat to watch all the characters grow older together. I liked how interested the librarians were in him and vice versa. The illustrations were very expressive. It was also fun to find out the author is a librarian. Loved this book!!! I read it before signing it to my niece and putting it in the box going to Joplin for Christmas. Oh my, it really is a lovely story, but particularly for this librarian and daughter of a librarian. Nice that my niece will get a little idea what her grandfather did for a living. My Aunt wrote this book!!! Way to go Aunt Carla!! Every day Melvin visits the Public Library after school. Melvin loves how everything has its place. His favorite people are the librarians behind the reference desk—Marge, Betty, and Leola. When something catches his attention, he gets help from his friends to find the information. As the years pass, Melvin gets older but still visits the library for everything. One day he leaves for college to learn new things and read new books. Will he return to his friends? Or will he leave them behind forever? Students who have a curiosity about something new and want to know where they can go and who they can ask for help. In small groups, students will pick their favorite book and talk about why they like it and what it is about. As a whole class, we will visit the library and talk about the characteristics of the books. Authors, illustrators, how to find the book in the library, who they can ask if they cannot find a book. This gives insight into a book creator and is not directly tied to a specific book. During my first few weeks of school, because I am a reading teacher, all of my read-alouds are about book and library appreciation. One of my favorite new additions is “The Boy Who Was Raised By Librarians.” This heartwarming story is great for lovers of libraries and the smell of a well-loved book. Everyday after school, Melvin goes to his local library. The women who work there help him with homework, schoolwork, various questions, and projects. He loves the library, and the for that, the libr During my first few weeks of school, because I am a reading teacher, all of my read-alouds are about book and library appreciation. One of my favorite new additions is “The Boy Who Was Raised By Librarians.” This heartwarming story is great for lovers of libraries and the smell of a well-loved book. Everyday after school, Melvin goes to his local library. The women who work there help him with homework, schoolwork, various questions, and projects. He loves the library, and the for that, the librarians love him. He grows up in the eyes of these librarians and grows up to become a librarian himself. While I deeply appreciate any children's book that praises books, reading, libraries, and/or librarians, this one is a bit over the top. Melvin seems to excel at everything and, with the tireless help of three reference librarians, he wins every contest he enters. I also wonder why a child is interacting with the reference librarians. Where is the children's librarian? And since the three librarians never help any other patrons, it feels like they dispense favoritism to Melvin over everyone else While I deeply appreciate any children's book that praises books, reading, libraries, and/or librarians, this one is a bit over the top. Melvin seems to excel at everything and, with the tireless help of three reference librarians, he wins every contest he enters. I also wonder why a child is interacting with the reference librarians. Where is the children's librarian? And since the three librarians never help any other patrons, it feels like they dispense favoritism to Melvin over everyone else. The illustrations are too cartoonish, considering this is not a humorous story. But I love the heartwarming twist at the end. I just love stories about libraries and this was such a sweet story. I love the different ways that the librarians could help the young boy learn and satisfy his curiosity. And I certainly loved the ending. The illustrations remind me strongly of C.F. Payne's style and complemented the story nicely, if a bit abstractly. I liked to see how the librarians aged throughout the book, still as happy and helpful as ever. We really enjoyed reading this story together. This story was selected as one of t I just love stories about libraries and this was such a sweet story. I love the different ways that the librarians could help the young boy learn and satisfy his curiosity. And I certainly loved the ending. The illustrations remind me strongly of C.F. Payne's style and complemented the story nicely, if a bit abstractly. I liked to see how the librarians aged throughout the book, still as happy and helpful as ever. We really enjoyed reading this story together. This story was selected as one of the books for the March 2012 - Library reads at the Picture-Book Club in the Children's Books Group here at Goodreads. Melvin's second home is the Livingston Library! He is embraced by three fun-loving, intelligent and spunky librarians who help him with research projects, guide him, welcome him and encourage his love of knowledge. Illustrated by Brad Sneed, the images are crisp, clear with lovely facial images. If you, like me, were raised by a librarian, or a series of librarians, you will appreciate this lovely book. Personally, Miss Alice Blake, former Bangor, PA librarian is one of the people who had a profoun Melvin's second home is the Livingston Library! He is embraced by three fun-loving, intelligent and spunky librarians who help him with research projects, guide him, welcome him and encourage his love of knowledge. Personally, Miss Alice Blake, former Bangor, PA librarian is one of the people who had a profound impact on my life. A skinny, shy, introverted child entered the stone structure and was forever changed by a caring, loving woman who saw a spark of intelligence and gave confidence and encouragement which has forever helped to shape the person I am today. Hats off to unsung heroes...the librarians! I loved this book! The illustrations and conversations are so heart-warming and touching. Melvin loved the library so much, he felt like he lived there...all facts, figures and information were at his fingertips, and he grew to love the three librarians, Leeola, Betty, and Marge, who all looked forward to his visit every day after school. Throughout his school years, up until he left for college, the library was his special place. He missed it terribly when he was away, as the librarians missed I loved this book! The illustrations and conversations are so heart-warming and touching. Melvin loved the library so much, he felt like he lived there...all facts, figures and information were at his fingertips, and he grew to love the three librarians, Leeola, Betty, and Marge, who all looked forward to his visit every day after school. Throughout his school years, up until he left for college, the library was his special place. He missed it terribly when he was away, as the librarians missed him. But, in the years to come, Leeola, Betty and Marge grew to love a new special person who loved the library, who had a very special connection to the library. This is another great picture book! Your children will love it, and you will too! I KNOW you all take your children to the library, (you are such great parents) and this is yet another book to reinforce what a wonderful place that is, and what endearing people librarians can be. Definately a "Storytime With Grandma Tash Gold Star Winner"!! (In case you may be wondering if I promote every children's book about libraries, not true...do not check out "The Library Dragon". It is a total disappointmen This is another great picture book! Your children will love it, and you will too! I KNOW you all take your children to the library, (you are such great parents) and this is yet another book to reinforce what a wonderful place that is, and what endearing people librarians can be. Definately a "Storytime With Grandma Tash Gold Star Winner"!! First of all, the title is misleading. I had anticipated a story about a boy actually living in the library and being raised by librarians and was disappointed by the first line in the book. The boy is actually a bookworm who spends all his time in the library and forms a family-like bond with the three librarians at his local library. Second of all, despite my disappointment, the story was actually pretty good and inspiring. The illustrations are incredible and could stand alone as a wordless b First of all, the title is misleading. I had anticipated a story about a boy actually living in the library and being raised by librarians and was disappointed by the first line in the book. The boy is actually a bookworm who spends all his time in the library and forms a family-like bond with the three librarians at his local library. Aww, what a sweet children's book! It's about a boy named Melvin who spends a lot of time in his public library and the friendship he develops with the librarians. The story is written by a children's librarian, and it does a good job of highlighting all the different services that libraries offer today. I would recommend the book to any parents who want to get their children excited about the library. "The Boy Who Was Raised by Librarians" is about a little boy who loves learning and reading so much. One day he went to the library after school everyday and basically was raised by the librarians. The librarians were always loving and excited and encouraging to him. I love this book, because it can make children excited about the library and make them want to read. I would have this book in my classroom, and I think it would be a great book to read to your children. 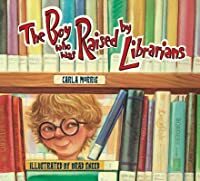 Melvin is a curious boy who loves the library, and as the author, Carla Morris, observes, "the library is a wonderful place to be if a person is curious." The librarians and Melvin share a loving relationship as they provide a welcoming, nurturing, learning environment for Melvin at the library, inspiring him and helping him learn about the world around him. This story portrays my love for books and libraries. My mom worked at the local library when I was eight, and I remember loving everything about it day after day. The feeling hasn't worn off and I hope to one day retire and work at a library! Very cute book, great for elementary level. The story of a young boy who loved the library. He didn't really live there but spent much of his time there. The librarians knew him and helped him with questions from grade school until he graduated from college. Very good. Probably more of a 4, but what the hell 5 stars. Had tears streaming down my face at the end. "That's how librarian's are. They just can't help it." Love it. Thanks to Liz for recommending. This is a sweet, sweet book that will completely appeal to adults. I find that the students enjoy it, too. Love this little picture book! I use it for field trip groups sometimes. This wonderful children's book's story arc hit pretty close to home for me. I recommend it to any librarian or library lover! !